in the center of America's second-largest city. The property is studded with mature pines, cedars, acacias, and toyons. Perched on a canyon hilltop, the site was carefully selected from the original 17-acre expanse for its amazing views across the entire city. The nighttime view is perhaps even more spectacular. A waterfall spills into the upper pond, then down a rocky creek bed. From under the wooden footbridge, it cascades into a large pool carved out of native bedrock. 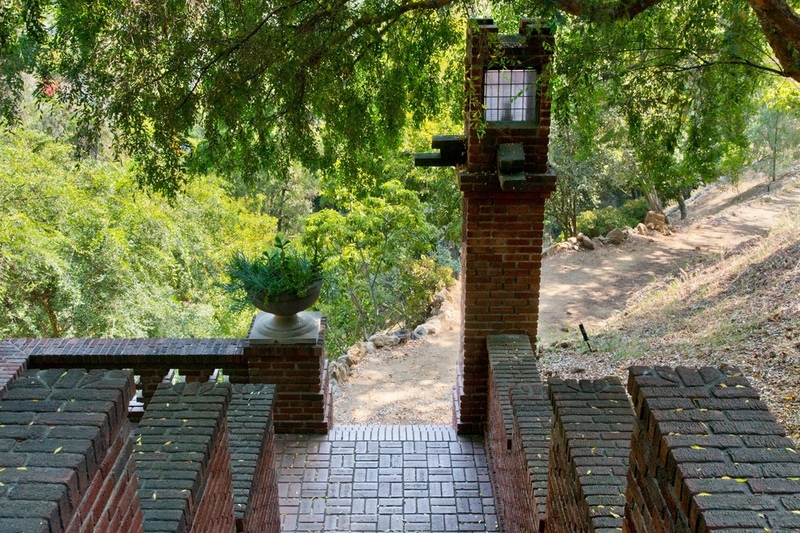 Gentle walking paths provide intimate views of the private canyon and its lush woodland. Water can be heard everywhere, from the south facade where the waterfalls gurgle to the rear patios, where the 100-year-old fishpond fountain spills over its gently curving rim. The detached carriage house contains a private one-bedroom apartment/studio, a garage, plus a sunny rooftop entertaining deck.